A perusal of The Madness within Us: Schizophrenia as a Neuronal Process is well worth the time of anyone interested in schizophrenia research. Author Robert Freedman is a clinician and scholar who also has a family history of schizophrenia. Inspired by Harry Stack Sullivan’s classic work, Schizophrenia as a Human Process, Freedman writes poignantly of the experiences of his patients and the struggles of their families, providing us with a very human sense of what it means to experience and bear witness to psychosis. In addition, Freedman provides a highly accessible and rich overview of the latest schizophrenia research from neurobiology, animal modeling, developmental and genetic studies. Freedman begins with historical and biblical accounts of schizophrenia symptoms. He also introduces us to two modern families, one whose son Paul develops schizophrenia at college and another in which two siblings ultimately develop schizophrenia, as well as the son of one of the siblings who does not have schizophrenia. The family’s stories provide a riveting depiction of the mysterious ways that polygenetic patterns in a family’s genome can be correlated with neurobiological conditions and their phenotypes, which are made manifest in family member’s lives as genius, as sensitivity, as creativity, and sometimes as schizophrenia. Freedman begins his neurobiological explanations of schizophrenia by asking what people with schizophrenia cannot do. Sensory gating deficits and the role of the P50 evoked potential studies are then described in detail. Freedman also provides an overview of phenotype research on schizophrenia, for example, P50 inhibition as a possible phenotype of sensory gating deficits attributed to specific genes. He discusses the complexity of research on phenotypes in schizophrenia and the possible role of endophenotypes, such as intestinal polyps, which are difficult to detect. The search for phenotypes and possible correlating genotypes continues. The latest research on alpha-7 nicotinic receptors, their role in sensory gating, and their potential as a target for novel pharmacological interventions — and the refusal of drug companies to investigate this possibility — are also presented in a very accessible manner. Freedman believes sensory flooding and difficulty with emotional regulation — the possible byproduct of aforementioned neurobiological deficits, genetic characteristics, and experience — are the foundation of suspicious thought in people who develop schizophrenia. Every human, Freedman explains, develops stories in their minds to deal with their everyday experiences, but people with schizophrenia tend to have paranoid narratives that only confirm the fears and sense of worthlessness. This is followed by a “failure of correction,” or an inability to test one’s beliefs in reality and realize that they are not true. Finally, people with schizophrenia experience profound conviction that their beliefs are true, which he compares to the experience of religious conversion. Freedman speculates that an inability to correct false beliefs, particularly in highly intelligent people with schizophrenia, may come from “accelarated learning ability, or alternatively, diminished forgetting, particularly in human beings” (111). He offers a neural explanation for this involving regions of the hippocampus. Overall, Freedman indicates that a neuronal inability to filter out incoming sensory experiences along with a delusional reaction to this experience that is never corrected — characterize what we think of clinically as schizophrenia. He claims his understanding of schizophrenia “is not one of deficit; rather for patients it is one of enhancement of brain function, albeit increasingly beyond their control” (114-115). Freedman concludes by encouraging us to think of ways to prevent episodes of psychosis, known as “relapses” that may be neurotoxic, as well as to demand pharmacological treatments that act on more than just the dopaminergic system. Targeting individuals’ stress response system may be important since higher levels of stress responsiveness are associated with increased occurrences of psychosis and more difficulty in maintaining independence in the community. He reminds us of the limits of our current medications, their neurotoxicity, and their origins as a “purple dye” before they were used as a medication. New avenues of treatment, he encourages, must be explored. I highly recommend this book for anyone with an interest in schizophrenia. 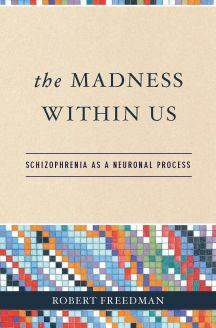 Myers N. Book Review: The Madness within Us: Schizophrenia as a Neuronal Process by Robert Freedman. Somatosphere. 2010. Available at: http://somatosphere.net/2010/book-review-madness-within-us.html/. Accessed April 18, 2019. Myers, Neely. 2010. Book Review: The Madness within Us: Schizophrenia as a Neuronal Process by Robert Freedman. Somatosphere. http://somatosphere.net/2010/book-review-madness-within-us.html/ (accessed April 18, 2019).